You know about the M&Ms store in Times Square, we’ve told you where to get some of the best chocolate-covered donuts in the state, and we’ve even spilled the (chocolate) beans on where to find world-winning chocolate in the Catskills, but there’s even more to New York’s chocolate scene than what we’ve already shared. You can have some pretty unique chocolate adventures in New York State, and we’ve rounded up some of our favorites. A whole trail dedicated to where you can find chocolate in Corning proves that there’s more to the town than just glass (though the glass is pretty cool). More than 30 restaurants participate in the self-guided trail. You can find some exciting offerings from the chocolate pâté at Three Birds Restaurant and the Nutter Butter peanut butter chocolate ribbon pie at Donna’s Restaurant to a Steuben Bar Chocolate Martini at the Radisson Hotel Corning and the chocolate and mimosa pairings at the Source. Chocolate Works in the charming walkable village of Stony Brook on Long Island offers a lot more than your typical chocolate shop. Recent workshops have included “Garden House Academy” (decorate a miniature chocolate house and flower cookie alongside chocolate milk and pizza), “Sweet Sushi” (make sushi out of candy), and “Flip Into Summer” (make and decorate a pair of flip flops made of chocolate). “BFF Time” offers adults a chance to chat with friends amongst unlimited chocolate fondue. There are also 10 other locations in the state, so find one near you! Stressed out? Just imagine how it would feel to be covered in chocolate in a relaxing spa room in one of the prettiest towns in the state. 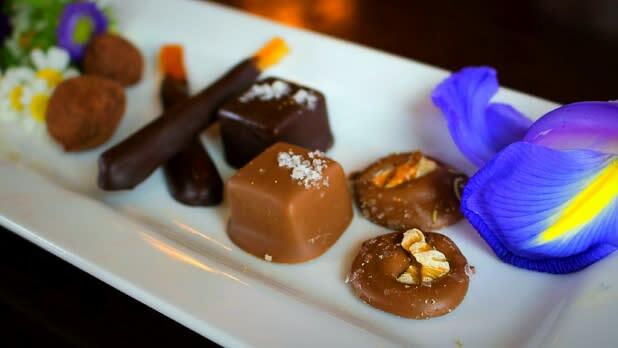 Don’t just imagine it, book your “Chocolate Indulgence” package at Saratoga Botanicals in Saratoga Springs. The package includes a facial with a chocolate banana mask and a chocolate indulgence body treatment. You’ll also get to take home more of the chocolate banana mask—though you may be tempted to eat it, it’s so you can continue your skincare routine at home! This region of the state is famous for its sponge candy (a light crunchy toffee coated in chocolate), and Platter’s Chocolate Factory is one of the most classic places to try it. They have also specialized in orange chocolate since opening in 1938, so try both! See almost all of the factory’s chocolate-making processes on a tour of the facility and of course, enjoy hot chocolate or an ice cream sundae along the way. The factory is most busy making treats from September to April but you can learn about the equipment, process, and history (and sample the goods!) year round. If you’re not the type of person who likes going to museums, we have one that might change your mind. 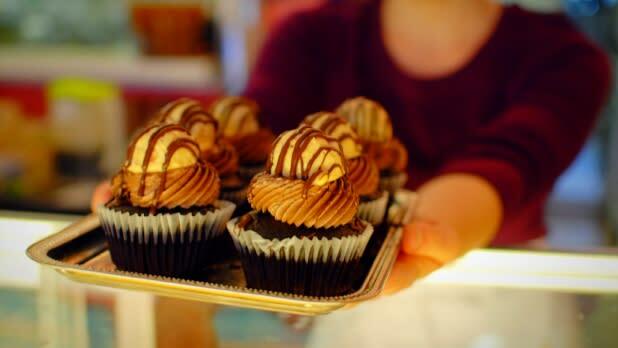 Yup, you guessed it, this one’s all about chocolate. At the Jacques Torres flagship store in Soho, you’ll learn everything you ever wanted to know about chocolate: find out how a plant becomes a sweet treat, learn the history of chocolate dating back to the Mayans, and watch bonbons being made! In addition to the included (!) tastings, kids will enjoy digging for chocolate artifacts in a sandpit, playing in a pretend chocolate shop, and trying to win prizes with the Choclala game. 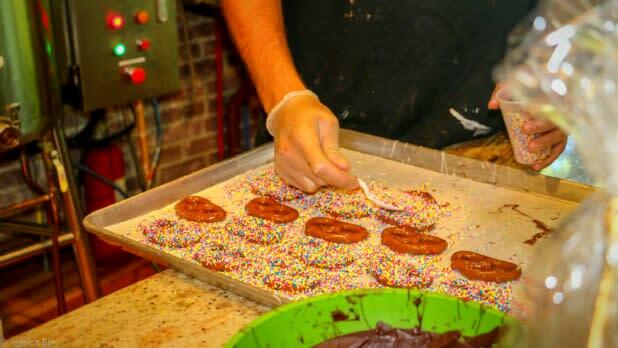 You can even add beginners chocolate-molding classes or cookie-decorating workshops to the experience. Not only does Barkeater Chocolates in the Adirondacks have gourmet, all-natural, non-GMO sweets—the building is also rumored to be haunted by a ghost that employees have named Miranda. Footsteps, banging, and voices have been heard by employees, visitors, and construction crews and the thermostat kept moving up to 85 degrees until employees taped the dial still. If we were ghosts, we’d haunt the shop for its “Bear Bombs” (milk chocolate, caramel, peanuts, and either coconut, sea salt, cherries, or cashews, seeds, and dried fruit); its “Grown-Up Peanut Butter Cups” (all-natural crunchy pb in either dark, milk, or milk chocolate with sea salt); and its “Quinoa Ka-Pow” chocolate bars. 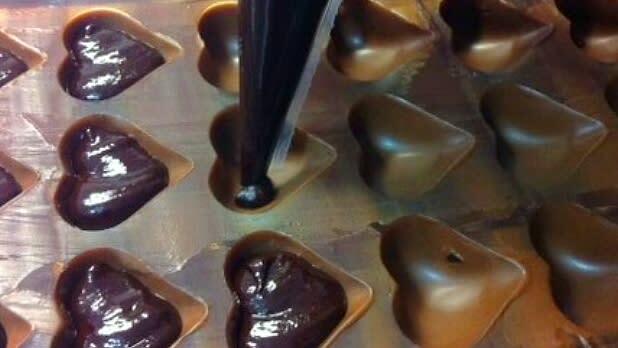 Chocolate-making experiences are offered for kids and adults with reservations made in advance. New York Kitchen is a not-for-profit organization that aims to "educate, engage, and excite visitors about the incredible agricultural, craft beverage, and culinary industries in New York State." Located in Canandaigua, 50 to 60 events are offered each month ranging from “Your Favorite Chinese Take Out” to “Gluten-Free Cooking.” For their wine and chocolate pairings, NYS wines are paired with three gourmet chocolates. 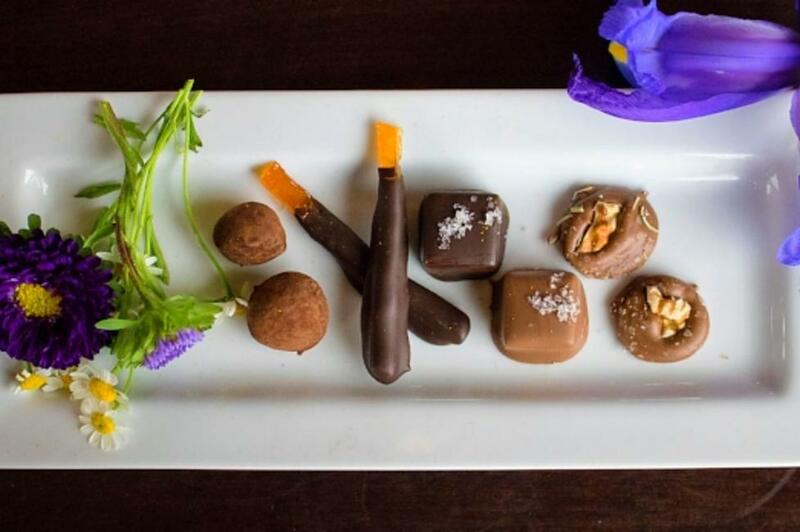 The pairing is hosted by a certified wine instructor and a representative from Hedonist Artisan Chocolates (in nearby Rochester, where they create all of their own chocolate in small batches using human hands). Wine-drinkers must be 21 and over. 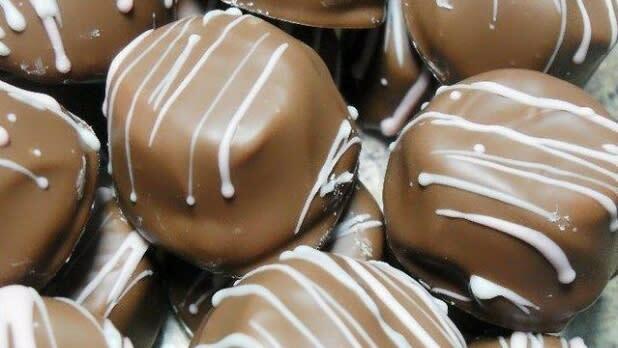 If you’re into making the chocolate and not just eating it, attend a chocolate truffle workshop. New York State is known for a lot in the foodie world, but perhaps most notably for its pizza and Buffalo wings. At the Chocolate Pizza Company in Marcellus, 25 minutes outside of Syracuse, they sell pizza and wings with a chocolate twist! Chocolate Pizza® is chocolate in the ingredients and pizza in the shape. Milk or dark chocolate mixed with homemade English toffee is poured into pizza pans and served in pizza-shaped boxes with various toppings like candy, pretzels, and nuts. Peanut Butter Wings®, are not chicken, but potato chips topped with peanut butter and dipped in either milk or dark chocolate. Chocolate Pizza Company also offers tours of the production facility. Erin Faherty is the Digital Editorial Coordinator of I LOVE NEW YORK. She is obsessed with traveling and always up for an adventure.